He’s the one that did those flowery wallpapers, isn’t he? It is a rare occasion (and a real joy) when the odd person has not only heard of Morris’ interior decoration hobby, chumminess with the Pre-Raphaelite Brotherhood, and/or his zealous socialism, but that he was an avid medievalist. Though I hesitate to call Morris a scholar, it must be admitted that his intense passion for the archaic, the Romantic, and the lovely elements of medieval texts allowed him to dedicate huge amounts of time and energy towards creating many original translations of both French lays and Norse sagas. It is the latter that I am primarily concerned with here, though I direct anyone interested in Morris’ French lay translations to seek out his Lancelot du Lac cycle, which he handwrote into four volumes, though he never completed it. 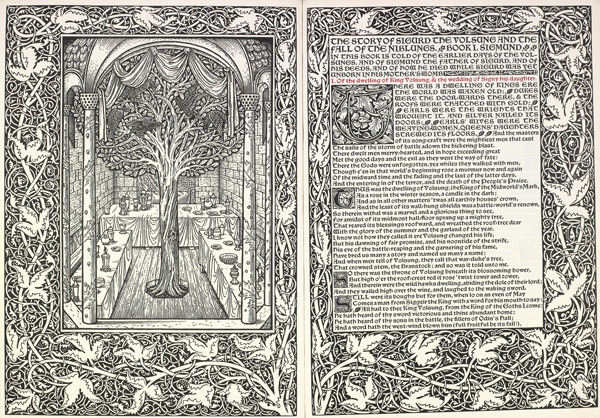 Morris called Sigurd the Volsung his masterpiece, claiming in the preface that he thought it equal to the great tale of Troy. It is an epic poem in four books covering the thirteenth century Norse text Völsungasaga, the history of the Volsung family. Much like Morris’ wallpaper designs, Sigurd the Volsung is composed in a flowery style that grates after the first thousand lines of rhyming couplets, until you resign yourself to the monotonous rhythm Morris found “authentically” Norse. In fact, Morris believes the entire venture to be a great tribute to the mysterious spirit of the “Northmen” that he so admired. The truth is a little more complicated: in my opinion, the only thing Norse about his poem is its source material. Morris claims the characters of the prose Völsungasaga and drives them to dance around in a Romantic fashion, within the English conception of a rhyming epic poem. The result is more humorous than his intended solemn, dramatic tragedy: the severe and stoic Gudrun becomes a wailing maiden, Sigurd himself is pretty much a knight, and if not for the occasional aside describing the wild landscape, one would be forgiven for forgetting the events transpire in Iceland. If you feel hesitant about delving into an epic poem or if you are seeking a closer approximation of Norse literature in English, Morris’ earlier work The Story of the Volsungs and the Niblungs will provide. This close translation of the Völsungasaga was a collaboration with Morris’ Icelandic friend Eiríkr Magnússon, whose interests in promoting Icelandic culture largely protects the text from Morris’ artistic flourishes. The result is that their edition of the Völsungasaga compares well even with modern translations, such as Jesse Byock’s (2000) or R. G. Finch’s (1965) translations, both titled The Saga of the Volsungs. Ultimately, Sigurd the Volsung is a testament to Morris’ personal experiences of Iceland, his love for the medieval, and his remarkable energy. To write an epic poem in between managing his printing business, working through relationship troubles with his wife, and his numerous other projects suggests the strength of feeling that the Norse world must have provided to him. Icelandic literature was his escape from the mundane tasks that English life burdened him with; his trips to Iceland at peak moments of struggle illustrate the physical freedom the country provided him with. In letters written home to friends, Morris admitted that Iceland was ‘all like a dream to me, and my real life seems set aside till it is over’. It is this personal attachment to the country that can be found in Sigurd the Volsung and so the poem reveals Morris’s perspective of the Norse mind, rather than the authenticity of the original sagas. Thought provoking! 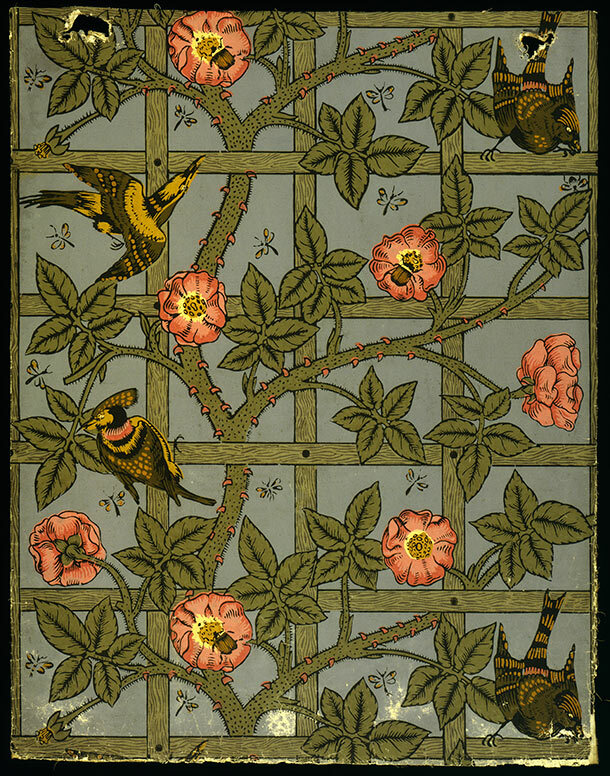 In my capacity for judgement I view Morris as an exemplar figure rather than comic. Perhaps it is time I brush up my Völsungasaga !